Superman, using General Lane's technological facility is monitoring star charts. The fire creature that attacked him from the Astrodome mentioned the word "Krypton" and that is preying on the Man of Steel's mind. General Lane reveals that the creature isn't from space and as far as they can decipher, it never spoke the word "Krypton" before it died. Lane points out it's probably a man-made monster designed to fight Superman and endanger the human populace. There it is; Lane can't help but throw in the odd jibe even when he has to work with Superman. While the two of them have quiet time Lane asks what Superman's relationship with Lois is. Mind wandering, Clark remembers earlier in the day as Lois and he moved into the new office at the Daily Planet. Lois was spending a lot of time reassuring Clark that their relationship hadn't changed. How similar they were, as people, colleagues... friends. Lois is concerned with Clark's sudden introverted behavior and emphasizes they will always be friends. She opens up about her friend Jonathan, whom it turns out was just a friend from out of town. Lois also opens up about the trouble she stirred by authorizing the patch into the city CCTV feed. Clark tells her she's worrying about nothing and listens to a PGN broadcast of the events of Superman's return. Cat Grant interrupts and tells Clark that Perry wants him to cover a 'social issues' story on a squatter in the old abandoned metro rail stations. Clark brushes her off and tells her he has a more important story and that she ought to cover it herself. Back in the present, Superman points out that to Lois he was always a headline - nothing more. Now that Lois is desk bound even that line is fading. Sam guffaws that while Superman is around Lois and every Metropolitan will always be in danger. The words cut deep and Superman snipes back asking, "Where should I go?" Lane says, "I'd tell you to go to Hell but it appears Hell has come to you," referencing the fire creature attack. Elsewhere work on rebuilding the Metro Rail Network has halted. The squatter scurrying around means the construction team can't do any work in case he comes to harm. Two police officers try to track him down, while unfortunately the reporter that was meant to cover the story is a no show. As the police draw closer the homeless man begins to huddle in the shadows and his eyes begin to glow eerily. High above the location, just as the time Superman passed over the Astrodome, an attack begins. Superman thinks back to learning about how to filter sounds with his super senses and is surprised when they seem to fail him. 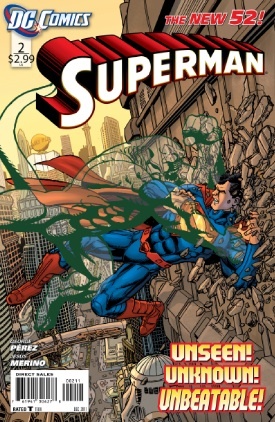 Smashed around the city Superman turns to his vision powers next, straining to see his attacker, again it doesn't work. Superman is sent hurtling through a building and worse still through a sightseeing airship. Miko and Jimmy are nearby in a news chopper and head towards the action relaying a feed to Lois in the office. The words on everyone's lips, "Why isn't Superman fighting back?" It's Lois that realizes somehow only humans can see the monster and that the video equipment was able to filter the creature's invisibility. Superman, struggling to fight notices the news feed on one of the city's video billboards. A swift uppercut to the beast gives Superman the opportunity to rescue the airship just in time. Superman allows the people to be his eyes. With their phones, netbooks, tablets and the news cameras, Superman is able to use the city's tech to gain equal footing to see his opponent. He fights the creature and drives the beast into an electronics superstore where there is nowhere for the creature to hide. The creature, beaten to submission, faces Superman's questions but instead utters the exact same phrases the fire creature did and fades away with the word "Krypton". Jimmy arrives and confirms the creature is gone while filming exclusive footage before the other stations. Superman is glad the attack is over and heads to his Fortress. As he records a journal on the events since his return, cataloging the facts, Lois beeps in to Clark's cellphone with a voicemail. In her message she apologizes if she'd put a strain on their friendship but it was only because she valued him as a friend. She tells Clark that no matter what she'll always be there for him and whatever it is he's going through, he needn't go through it alone. Elsewhere, the nightwatchman from the Astrodome had survived being engulfed in the flames and was in hospital, deep in a coma. The homeless man sneaks past security into the watchman's room. Eyes glowing he approaches and suddenly the watchman awakens uttering the same phrases as the fire and invisible creature - "Krypton". Story - 5: I don't like the distance forced into Clark and Lois' relationship. I'm not talking about the whole marriage thing but having her trapped in an office feels unnatural - personally pulling her away from Clark and their team dynamic, regardless of the Superman bond, is a creative misstep. Perhaps because I'm used to Lois being a go-getter not a bystander. As it is still unclear what happened previously between Sam Lane and Superman (as that story is currently at a snail's pace in Action Comics) it is hard to figure out exactly how to define their relationship, but that isn't to say their interaction wasn't interesting. I like that while Action is retelling the story of Project 7734 and Secret Origin, we're getting fresh material derived from that. Better still in four short months the gap will be bridged. Superman #1 & #2 can't be accused of being sparse with story, there is so much here that there doesn't seem to be enough pages to tell the story. I'm really interested to find out exactly what these foes are and their link to Krypton. Art - 4: The art is very strange, stylistically - you can really tell where Pérez and Merino flip the art chores, or perhaps that's me as a reviewer analyzing it too closely. It is all visually stunning but it doesn't seem to settle on a comfortable style; perhaps a casualty to the mass of story cramped in (not a bad thing - I like getting a LOT of story for my money). Cover Art - 4: Seeing the creature ruins the effect of the cover. I think if we saw the damage and Superman grabbing 'nothing' like he did in the story it would have looked far more menacing in that kind of horror/suspense style that came along before Photoshop layers. Again it's not bad, just preference.